Incidence of tick-borne disease (TBD) in the northeastern states is increasing. New pathogens have been identified and vector distributions appear to be expanding. Unfortunately, due to funding challenges the information and expertise needed to assess risk, inform the public and act proactively is dramatically lacking. After consulting members of the NJ mosquito control program, which in New Jersey is comprised of independent agencies in each of the 21 counties, we are confident that reliable and critical baseline tick surveillance data can be obtained by mobilizing and training existing personnel. Mosquito control professionals have a high level of expertise in surveillance and in many cases, a strong desire to learn more about ticks. For this proof-of-concept project, we will focus primarily on the distribution of Dermacenter variabilis, the American dog tick, although all specimens will be identified and tallied. Hold a training workshop open to professionals from each agency for training in basic tick biology, ID, tick-borne pathogens, surveillance, and standard operating procedures (SOPs) for collecting ticks. A standard tick-sweep will be provided to each county. 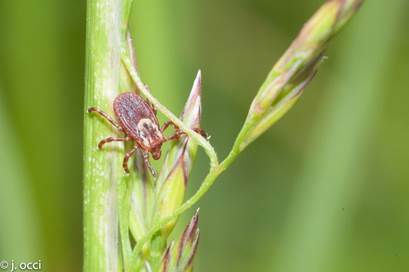 Hold a 1-day "Tick Blitz" in which trained professionals from each agency will go out on the same day at the same time with the same SOPs and collect ticks from a representative habitat in their county. Identify and test for pathogens the specimens collected (IDs and tests will be performed at the Center for Vector Biology, Rutgers University). The results (tick species and pathogens detected) will be compiled and summarized at the state level and will also be provided to each partnering agency, which they can use to improve tick education and outreach efforts within their county and if they choose, as preliminary data to seek funds for additional tick surveillance. At the conclusion of the project, both lessons learned and materials developed (curricula, SOPs, etc.) will be disseminated widely, including in scientific publications, talks, and on our website, so that other areas could conduct a similar exercise. The Tick Blitz is funded by a Northeast-IPM Partnership Grant to Rutgers University.